Moonrise Kingdom (2012), PG-13, 94 minutes - Wes Anderson films are always a bit odd and a little quirky. As a result he's developed a pretty good following for an independent film director. I personally tend to find his films very entertaining and Moonrise Kingdom is just another example of this. With his latest effort, Anderson takes us to an island off the coast of New England circa the 1960`s in order to tell the story of a young couple falling in love. Sam (Jared Gilman) and Suzy (Kara Hayward) are both quirky and awkward and neither feels that they fit in at home or with the other kids their age. This common belief draws them to one another and they run away together, Sam from scout camp and Suzy from home. After their disappearance is noticed, an island-wide search begins led by Police Captain Sharp (Bruce Willis), Scout Master Ward (Edward Norton), and Suzy's parents Walt and Laura Bishop (Anderson regular Bill Murray and Frances McDormand respectively). On top of the solid cast already mentioned, Jason Schwartzman (another Anderson mainstay), Tilda Swinton, and Bob Balaban also make entertaining contributions. 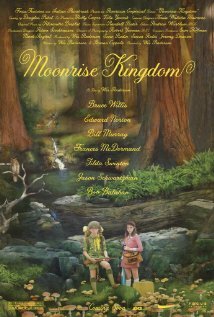 Moonrise Kingdom is an endearing story filled with characters that are very well written and acted. I think that it is probably Anderson's most main stream film to date, while retaining his signature look and feel. Any Wes Anderson fan will thoroughly enjoy this film (and probably already have since it came out last year), but for anyone else I would highly recommend giving it a shot as a rental. Had I seen it earlier, it would have made compiling my Top 10 Films of 2012 list a bit more difficult. A few years ago, American Express ran a series of ads with various celebrities showing what they used their AmEx card for. This one featured Wes Anderson and was just as crazy and quirky as one of his films. I couldn't help but share it here because watching Moonrise Kingdom made me think of it. "The snow was too loud!"